and "Chalice and Bread" by James Emery, used by permission under a Creative Commons License. Leccionario en Español, Leccionario Común Revisado: Consulta Sobre Textos Comunes. Para obtener más recursos leccionario, Estudios Exegético: Homiléticos. The number of readings may vary, but Exodus 14 and at least two other readings from the Old Testament should be used in addition to the New Testament readings. Genesis 22:1-18 God accounts Abraham righteous by his faith, not sacrifice. Isaiah 55:1-11 God invites all to come to the waters. Ezekiel 36:24-28 The promise of a new spirit and a new heart of flesh. Ezekiel 37:1-14 Life restored in a valley of dry bones. Romans 6:3-11 Buried with Christ in baptism, we are raised with him to walk in newness of life. Luke 24:1-12 Arriving at the tomb to anoint and spice the body of Jesus, Mary Magdalene, Joanna, Mary mother of James and other women who had come with Jesus from Galilee found the stone rolled away and two men in dazzling clothes standing beside them. The women bow their faces in fear, but the men told them not to be afraid and that Jesus had risen, as he had said. They left the tomb and told the eleven and other disciples of Jesus what they had seen and heard. Their testimony was not believed, except by Peter. Peter went to the tomb, found there only linen clothes, and left amazed. The Easter Vigil is historically the first service of Easter. It may be held any time after sunset on the eve of Easter (Saturday night) or before or at sunrise on Easter morning. Many congregations offer it just after sunset, when the bonfire and the candles may contrast with the increasing darkness. Some also offer vigils of prayer that continue until the principal service on Easter morning. The Great Vigil has ancient roots in Jewish-Christian practices. It is organized around primal experiences of fire, word, water, and table. See Easter Vigil or The First Service of Easter or The Great Vigil of Easter for sample services. For an introduction and planning guide, see Preparing for the Easter Vigil. For guidance on follow-up conversations with persons participating in this service, see Reflecting on the Easter Vigil. The Great Vigil of Easter may be the longest, most solemn, joyous, and symbol-rich service of the Christian Year. Getting your arms around this service involves planning for what may be four assemblies in up to four different places and the transitions between them. The basic structure of this service is described in The United Methodist Book of Worship, 369-376. The assembly around the bonfire (or a large paschal candle if the weather outdoors does not cooperate) is an assembly of solemn joy. At the end of the Maundy Thursday or Tenebrae service, all candles should have been extinguished and removed from the worship space. Now, a new fire blazes outdoors. (Christ was raised outdoors!) 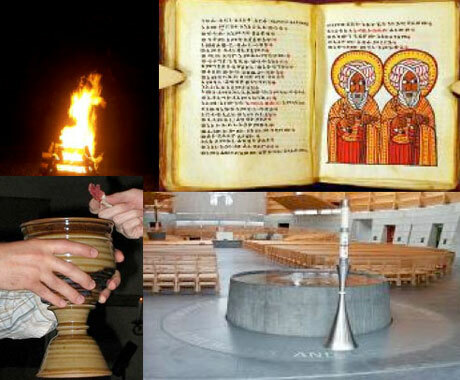 From the bonfire, we bring light indoors to the paschal candle, stationed by the font. The paschal candle then becomes a source for light for the whole assembly in the worship space, as each person receives light from the new fire. This is symbol and foretaste of the Risen Christ bringing light to the whole world. As the new fire enters the worship space and approaches the paschal candle, an ancient responsive chant is sung three times, ascending by one tonal step each time. Leader: The light of Christ. The joyous ancient hymn, “Exsultet” is sung, led by a soloist. All join in a joyous refrain (dowloadable musical response). “This is the night when Jesus broke the chains of death and rose triumphant from the grave!” Then all receive light from the paschal candle, and move to their places for the second assembly, the assembly around the Word. Where will your bonfire be? Do you need to get any clearances from local authorities for an open flame? (Be sure to follow local ordinances! Nothing could be worse than to have your joyous service interrupted by the local police!) How will people be able to assemble around it? Will you have music and texts printed for people to hold outdoors, or will you give oral instructions and teach them the refrains? It is this section of this night’s ritual from which the “Great Vigil” gets its name. A “vigil” is a service of “keeping watch.” Historically, vigils have involved extended Scripture readings, psalms (or songs), and prayer, much of it in silence. If you have celebrated a service of lessons and carols in late Advent or on Christmas Eve, you have experienced something of how this pattern works. Perhaps the key difference is choral music tends to take center stage in those services. In the Great Vigil, however, the Scriptures recounting the sweep of salvation history are front and center, and the congregation participates actively in praying the responsive psalms or singing the hymns. Choirs in this service primarily support congregational singing. Creation, fall, and redemption from sin are the basic framework for lessons and carols. Tonight’s readings may also begin with two readings from Genesis (creation and flood), but the primal story for the Great Vigil is the Exodus—God’s rescue of the people from captivity in Egypt. That is why the reading from Exodus 14 is not optional for this service. There are many readings, even if you go for an abbreviated version with the bare minimum of three Old Testament texts, three Psalms, the epistle, and the gospel. Persons unaccustomed to the contemplative flow of the vigil format may find themselves squirming a bit, wondering when this part will be over, and they can move on to the next thing. Part of your role as worship planning team and as leaders for this section is to help folks “settle in” rather than “tune out.” If folks are seated in the same place throughout this entire section, or the readings are offered from the same place, they are likely to tune out quickly and have a hard time reconnecting later on. The model version on our website resolves that problem by having the readers read from different locations around the worship space. You may also wish to consider moving the entire assembly through a variety of stations (one for each reading) during this section, so that there is a clear sense of movement both in the stories and in our own physical movement that we are travelling through history, celebrating God’s mighty acts of salvation in each stage and place. Keep folks connected. Help them settle into the rhythm of reading/song or Psalm/ prayer. Lead them to abide deeply in each story, song, and prayer, and then move to the next with the flow of God’s story of deliverance, Christ’s Passover, for us all. The gospel reading, this year from Luke, has two functions in this service. It concludes the vigil part of the service (readings, psalms, hymns, prayers). It also makes way for a homily that explores not only this text, but the sweep of salvation history for the sake of all who will be baptized or reaffirm the baptismal covenant at the font and then feast with us (the newly baptized first!) around the Lord’s Table. What brief and eloquent connections you make here will depend on the stories you have read and experienced together, the stories of those who come for baptism or to reaffirm it, the liturgy already experienced, the two movements (font and Table) to come, and always upon the main story—the resurrection of Jesus Christ from the dead. Tonight is a night for rich celebration and full immersion in the mystery of salvation opened to all in the resurrection of Jesus Christ. Use water and anointing oil generously. Be sure your font is large enough to allow plenty of water for all who may be baptized to be immersed or at least drenched in water (at the very least, their heads fully wet!) as well as for all who may wish to use the water for themselves to reaffirm their vows. Be sure, too, to have plenty of towels in place, ready for all who will need them to use. Nothing minimalist here! And for those who are being baptized or confirmed at this service, be sure to have plenty of oil, perhaps even oil blended with (hypo-allergenic) incense for fragrance. There is no reason for any attitude of “a little dab will do ya” when it comes to the blessing the Spirit intends for those who have come to the waters. Early Christian and Jewish anointing rites were not “dabs” but generous pourings. Yes, this will mess up people’s hair and perhaps their clothes. But doesn’t the Spirit indeed graciously upset all our lesser occupations to drive us into mission in Christ’s name? Let the symbols you use and the lavishness with which you use them convey the richness and power of God’s transforming grace. Over the years, a number of people (a vocal minority) have complained that our baptismal ritual is too boring, too wordy, and takes too much time. Tonight is a night to give it all the time, passion and power you can give it. Do this well tonight, and each time you do it hereafter folks may wonder why you don’t do it—and this fully—more often! Boring ritual can be the result of tired or disconnected words, to be sure. But it is more often the result of a disconnection between the power of the words and the power of the ritual action. The baptismal covenant is not primarily an exercise in reading, but in action. The vows are not designed to be mere, almost passive, “I will” sorts of assent. They are, historically, the solemn and vigorous responses of the people of God to God’s gracious initiative to us to set us fully free from the power of sin and death. There is nothing un-dramatic or boring about that! The thanksgiving over the water is another point where people’s eyes may glaze over. “Why do we need to do all of this? Can’t we just wet ’em and beget ‘em?” Again, the reason for that reaction may well have to do with how this part of the ritual is performed. Are you just reading this text from a book or bulletin, looking down, stumbling and bumbling through the words? Or are you and the gathered community offering yourselves to God in prayer here, in the passionate sacrifice of praise and thanksgiving for the new covenant made possible in Jesus Christ? These words are given to help you offer yourselves fully as you prepare to witness new birth and reaffirmation of commitment to God’s covenant in your midst. When the leaders of ritual lead it graciously and confidently and invite the assembly to join them in such offering of prayer and ritual action, the results are electric. The Spirit flows. People are transformed. God is truly praised and the people truly blessed. Celebrate here with gracious joy, with abundance of water and oil, with thanksgiving. And then you will be joyously ready for the Feast of Saving Love. The transition to the Lord’s Table tonight happens at the exchange of the peace. You will already have confessed sin and experienced tactile pardon with water and oil around the font. Now is the time to embrace sisters and brothers, to offer the Shalom of Christ to one another. This prepares you to gather around the Table as one body, water-washed, Spirit-born, ever-blessed and blessing. If at all possible where you are, plan to gather literally around the Lord’s Table tonight. Be sure to make provision so that those not able to stand are able to sit. Put Table at center, or put yourselves around it so it functions as the center, and begin and join the Great Thanksgiving with joy! (See The United Methodist Book of Worship, pp. 66-67, for the Great Thanksgiving for this night and throughout Easter Season). “Praying that thing” involves more than just words. It involves being fully present to God and the assembly. It involves allowing yourself and helping the congregation allow itself to be an open channel for the Spirit’s work. “It is the Spirit who prays in us when we do not know what to say,” and even when we do. And it involves matching our actions as leaders and people to the words we offer. At the words about the bread, either lift the bread (but do not break it yet… that comes later!) or move your hands over it, or touch it. At the words about the cup, either lift the cup or move your hands over it, or near it. At the prayer in which we call for the Spirit to bless us, move your hands to bless the people, and invite them to do likewise. At the prayer for the Spirit to bless the gifts, bless them (sign of the cross, or hands extended over them), and invite the congregation to join in doing the same. And at the Great Amen, sing it, shout it, rejoice and help your congregation keep rejoicing for as long as they need to. Do not quench the Spirit! For more complete, step-by-step guidance for celebrating, voicing, and embodying Holy Communion well, see Living into the Mystery. Break the bread, and offer the broken loaf and the poured cup to all in joyous silence, or with the briefest of words. And then share the feast! Even this exuberant, ecstatic moment of Holy Communion with the body and blood of our Risen Lord is not the climax of our worship tonight. The joy continues to build toward the sending into the world as the Risen Lord’s disciples, reborn or renewed. Give hearty thanks after Communion. Sing a rousing Easter hymn! Have a bold and powerful processional from the worship space. And then plan to let the celebration continue, perhaps with a post-worship party for those who wish to stay and feast some more. And for those who stay, and those who leave, encourage them to share the good news of Easter joy with all they meet on their way home. If you have never experienced an Easter Vigil Service, you may want to participate in a service in another church that holds the service this year. This way you and others from your congregation can get a sense of what this service is and how another congregation lives it out. Then you can host such a service next year. The United Methodist Book of Worship (369 and following) provides the essential directions and the texts for the Easter Vigil Service. Your congregation will want to make imaginative use of these resources, using the gifts and resources of your congregation in enacting this service of sacramental praise and prayer. Be sure to plan it well and involve a number of people in preparing the various parts of the service. Here are some concrete examples. Have someone in charge of preparing and caring for the bonfire ("new fire"). Enlist someone to plan for, recruit, and train the readers for the readings/storytelling of the Word portion of the service. Provide a number of rhythm instruments that children and adults can use in the music or in responses to the readings—especially for the Song of Miriam! If you will baptize using lots of water, whether by immersion or pouring, have a team prepare the space for this action. And don’t forget the towels!